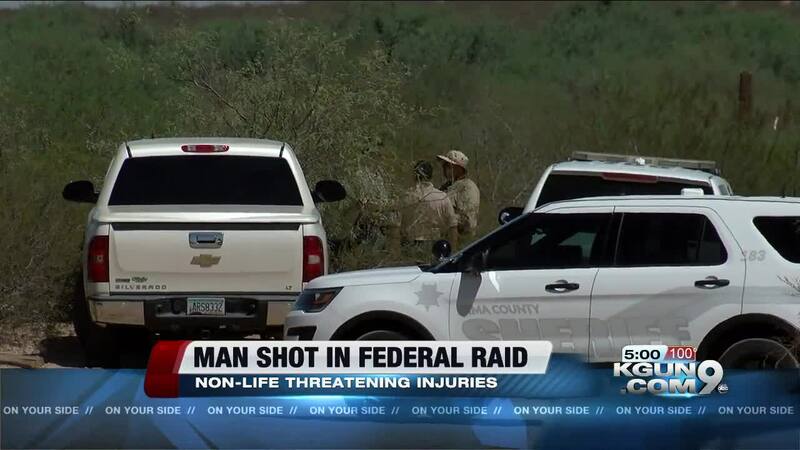 AVRA VALLEY, Ariz. - Federal agents shot and wounded a man as they tried to arrest him Thursday morning. It happened in the Avra Valley area in the 12,700 block of Antelope Road. Now Pima Sheriff's Deputies are investigating the shooting. About 5 in the morning agents from the Federal Bureau of Alcohol Tobacco Firearms and Explosives tried to serve an arrest warrant and a 65 year old man at this site ended up shot. Agents from the Bureau of Alcohol, Tobacco, Firearms and Explosives wanted Chris Snow for illegal possession of ammunition and a sting-ball grenade . It is illegal for him to possess ammunition because he's a convicted felon. He served four years in state prison for involvement in a meth ring. Law enforcement often serves warrants very early in the morning. It improves the chance the person they want is home. There's also a tactical advantage because the person they're after may be off balance and disoriented from just waking up. But something happened that left 65-year-old Chris Snow shot and wounded. Now the Pima County Sheriff’s Department will investigate the shooting. Deputy James Allerton says, "The ATF asked our department as the local agency to come and investigate the shooting as an independent eye, an independent agency to look at the events that occurred." No agents were hurt but what prompted them to shoot is the sort of detail that may not be released until the investigation is farther along.